We’re often asked if identifying animals from their footprints is analogous to identifying humans from fingerprints.Unfortunately, the answer is no! Animal footprints are much more complex data. Take a look at this rhino footprint, fresh in from Namibia, and you’ll start to see why. Unfortunately, and perhaps curiously, the answer is no! Animal footprints are much more complex images. 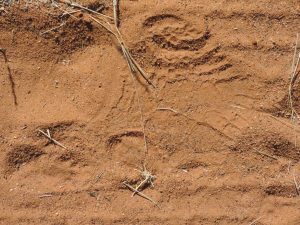 Take a look at this rhino footprint, fresh in from Namibia, and you’ll start to see why. Firstly, your fingerprint is the same wherever you place it. Inky finger + paper = repeatable pattern. An animal also has a unique foot, but also each footprint is unique! He or she places a unique footprint down in the sand or substrate each time they move a foot. The imprint of the foot depends on several factors including the type of substrate, the gait, the stride, the pace, and even the weather conditions. Secondly, while humans are asked to present each finger in turn as they’re documented, animal footprints are all stretched out along a trail with no labels. We, as human interpreters, have to know the difference between left and right, front and back, and be prepared for changes in direction, pace, light etc. Thirdly, while Homo sapiens is just one species, the endangered species we share the planet with all have different foot morphologies, and so we have to develop a different analytical algorithm for each. That’s why the science of footprint identification, ichnology, provides such a great challenge for computer vision techniques, and why we remain in awe of the traditional tracking skills honed by our ancestors.